Truckee’s Jonathan Penfield (first place) hoists the first-place trophy at Bec des Rosses, while Local rider Sammy Luebke (left) celebrates second place. Local snowboarders Jonathan Penfield and Sammy Luebke put on a show at the final stop of the Freeride World Tour in Verbier, Switzerland. Penfield and Luebke sent it on the legendary Bec des Rosses, launching massive airs off boulders and cliffs to finish first and second, respectively. Penfield opened his run down the Bec with a trio of big airs, followed by a backside 360 off a boulder to finish with 2,500 points. 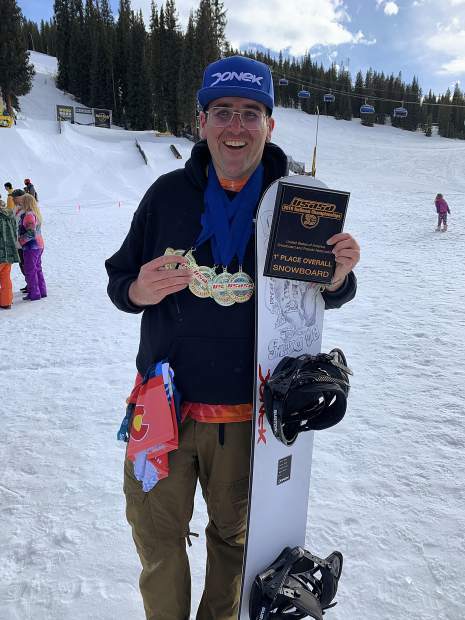 Luebke, who was the three-time defending Freeride World Tour champion in snowboarding, finished second behind a huge air off the second feature, followed by a 360 and another massive air to finish out his run. 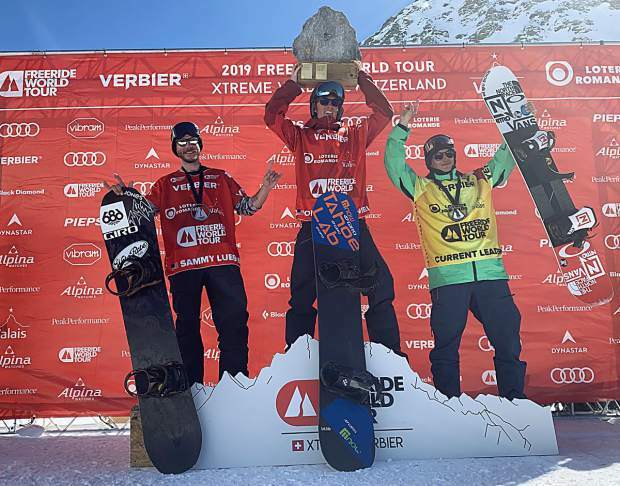 Luebke, 29, was awarded 2,200 points by the judges, finishing runner-up after winning at Xtreme Verbier the past three years. “The contest season has come to an end,” Luebke posted to his Instagram page. “Hyped to make it on the podium once again, and in no other place than the finals in (Verbier). Big congrats to (Penfield) for taking home the gold. Luebke finished the season fourth overall in the standings with 7,670 points. Penfield was fifth with 7,555 points. France’s Victor de Le Rue took the men’s snowboard title with 9,180 points. Local rider Christopher Galvin, 31, finished the year ninth with 3,105 points. 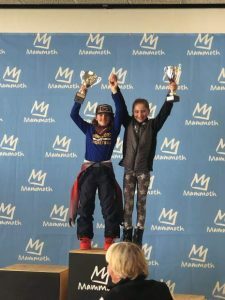 In women’s skiing, Jaclyn Paaso, who grew up skiing at Squaw Valley, finished in sixth place with 1,455 points. Paaso, 37, finished the season sixth overall in the standings with 6,870 points. 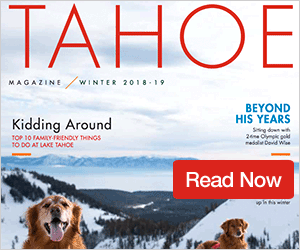 Mammoth Mountain rider and snowboarding legend Steve Klassen, 54, was given a wild card spot for the event, and didn’t disappoint, finishing fifth on Bec des Rosses. 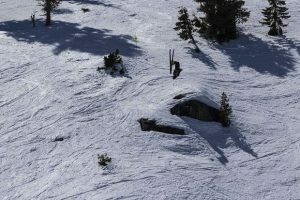 There have been 24 editions of the Xtreme Verbier competition, and Klassen has competed in 18 of them. Klassen sent it off another cliff, clearing rocks below, but didn’t land cleanly. He then threw a 360 off a ledge, and hit one final feature to finish in fifth place with 1,625 points. 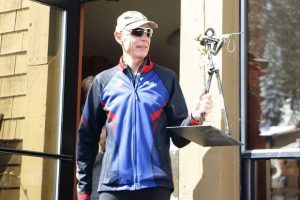 “I felt good on my top air,” said Klassen. “I was a little more tired than I thought I’d be at the bottom. That was probably why I didn’t stick the bottom air. I was just tired … other than that I felt great.